Michael Essien made his debut for new club Sabail FC in the Azerbaijani top-flight league on Sunday afternoon. 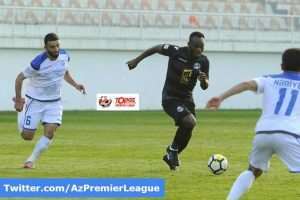 The Ghanaian midfielder who joined the club on a short term deal last month came on in the 65th minute at the Alindzha Arena where Sabail FC were beaten 3-1 by Sabah FK. The 2012 UEFA Champions League winner will also be involved with coaching the club’s youth teams as he prepares for life as a coach when he retires.